Many years ago when i wrote my first programs on a Atari 800XL you only had to turn on your computer wait some seconds and after that you could start to draw lines our print some strings on the screen. Today computers are much faster und programming is much more complex. Before you can draw lines, diagrams or tables you have to build a GUI and you have to do a lot of other things that have nothing to do with your problem that you want to be solved. Sometimes I only want to check if an algorithm works as expected or I would like to see the result of the computation of an intersection of lines or circles by drawing a vector grafic. I would like to start to program my algorithms without wasting time to build a GUI. Thats the reason why I started to develop this tiny Lua IDE. 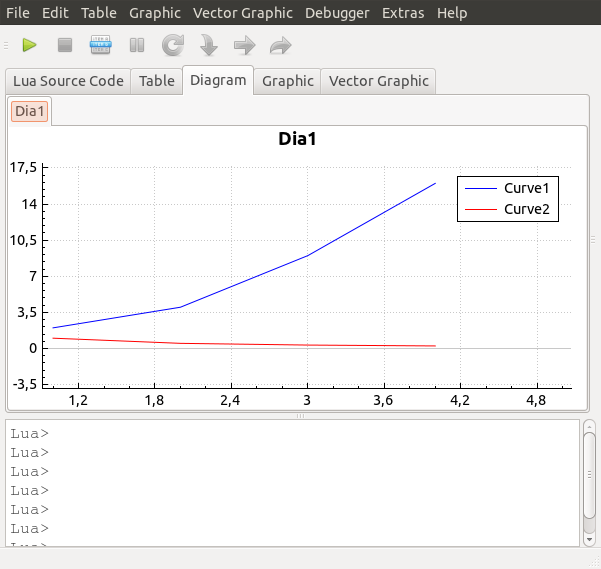 Lua is an easy to learn and fast scripting language with a pascal like syntax. This makes it easy for beginners to write their own programs in Lua. 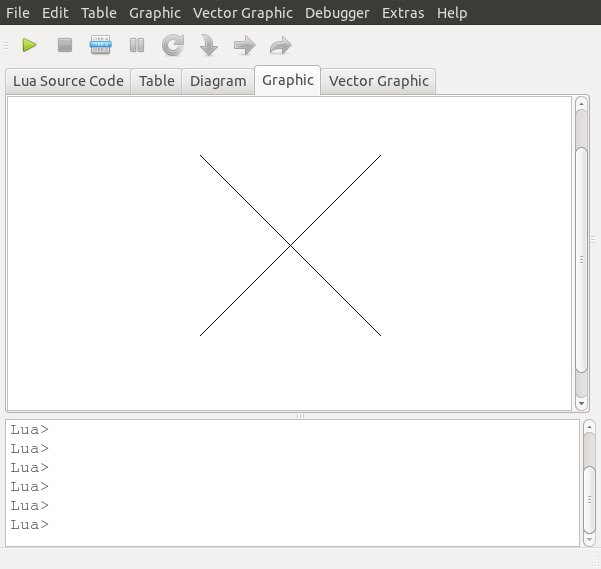 Lua is used in many games and applications to extend the existing functionality and to program user defined sequences. There are many tutorials in the world wide web to learn Lua. 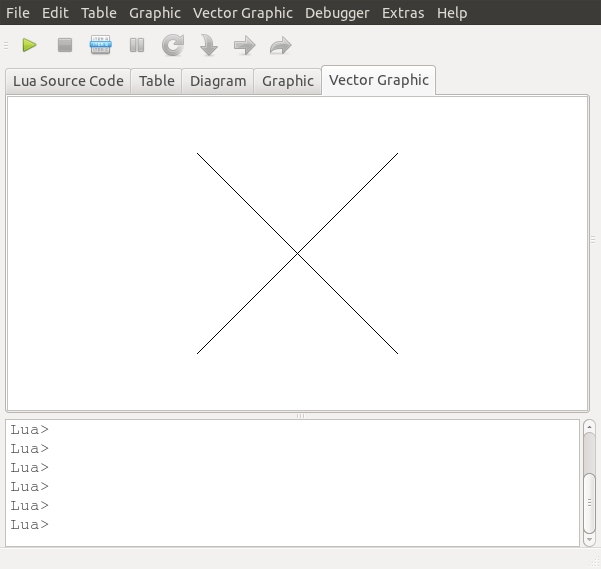 Many informations about Lua can be found on the Lua home page: http://www.lua.org. I hope the IDE is self-explanatory. Breakpoints can be set with a click right beside the line number. If the debug mode is enable the variable view will be visible on the right side of the main window. 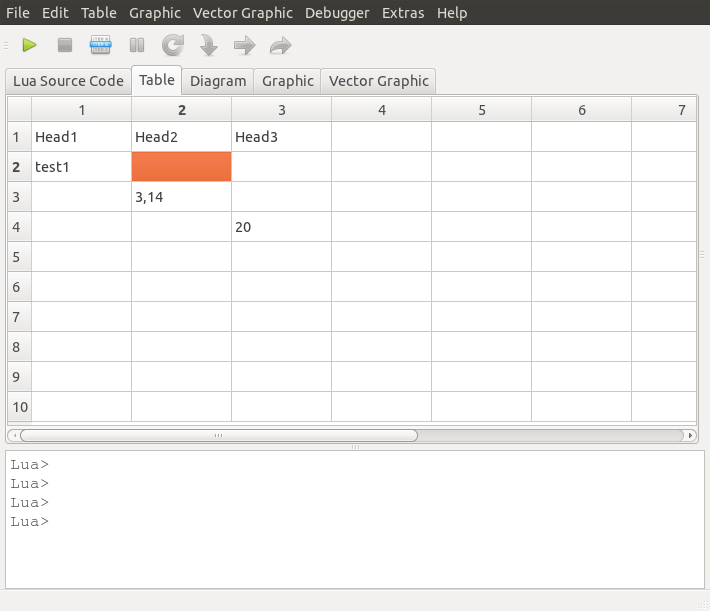 The size of the variable view can be changed be dragging the left border. The different sizes for debug mode on and off are stored and restored if debug mode is enabled or disabled. You can use the mouse wheel to change the visible size of the diagrams and graphic. The right mouse button can be used to open a context menu for the diagrams with functions to save or zoom the diagram. 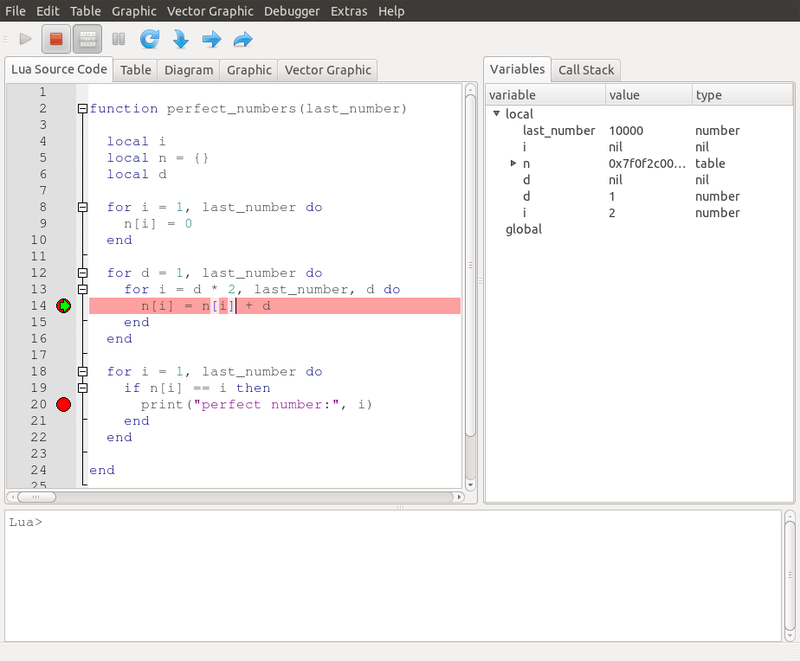 During development of Lua-Quick-Try-Out my focus was on an IDE with the purpose of easy programming with quick results. Therefore I did not implement a full project handling and GUI builder. The disadvantage is that it is less flexible. If you plan to write large programs with a complex user interaction you should use an other IDE and programming language. You might be wondering why the binary files are so large. The files are linked with the QT library statically. This should prevent installation problems. If you want to contact me by e-mail it may take a long time before I answer or sometimes I will not answer because of my very limited spare time.